Recently I came across the variable ctx (link) in SharePoint which allows you to get the name of current list/library without any fuss. 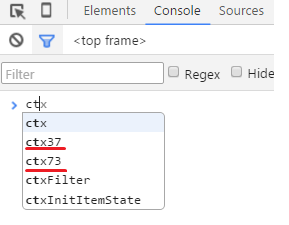 Apparently the ctx variable has quite few more tricks up its sleeve. It can return values like, GUID of list/library, site title, no. of currently selected items and more. But I cannot find any MSDN documentation for this variable. Is the use of this variable supported by Microsoft? I am currently developing on SP 2010 so I can verify that it works there. But what about SP 2013? Also with every example for JSOM starting with var ctx = SP.ClientContext.get_current(); we are bound to override this useful variable. ctx is a global variable. It belongs in the list view pages. So if you use above line in any list view pages, it will cause an issue. The value of ctx will be overridden by SP.ClientContext.get_current();. You will not get any info from ctx after above line. If you have multiple lists in a page, then you will have multiple ctx. PS: Unfortunately, It is not documented by MSDN. The all we have for exploring it is: Browser's console. Not the answer you're looking for? Browse other questions tagged 2010 jsom or ask your own question. How can I know what kind of App I am in? Sharepoint designer set variable date to string in a different format? How to dynamically disable/enable pages depending on certain variable?